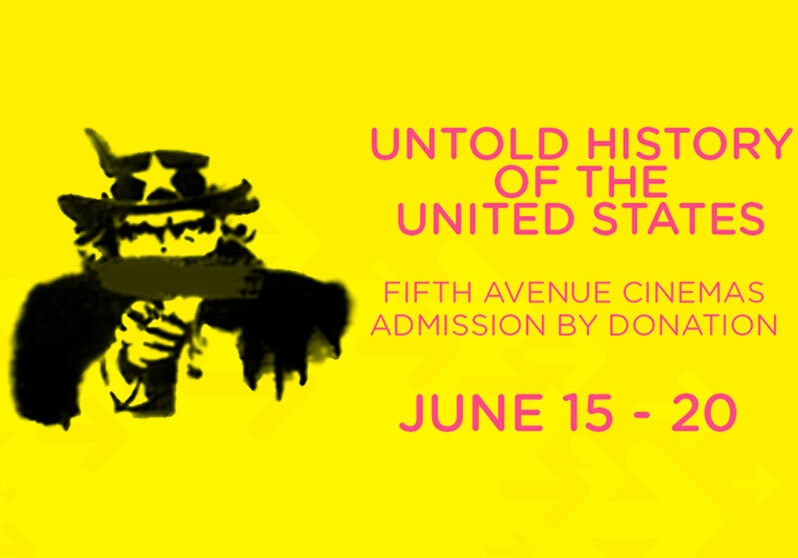 Don’t miss Oliver Stone’s entire documentary series Untold History of the United States at Fifth Avenue Cinemas! From June 15 to June 20 the Vancouver Biennale and Cineplex will be presenting an entire run of this groundbreaking series on matinee screenings. The CineFest LIVE program supports the Biennale mission to celebrate the contemporary arts in public space, and will integrate film into the larger Biennale exhibitions via outdoor urban projections, Master Class workshops, film retrospectives and emerging filmmaker competitions. Later this summer, the Biennale will feature films by and about Ai Weiwei, Vik Muniz and Brazilian street artists Os Gemeos alongside their public art installations, giving the artists the opportunity to showcase the multi-dimensional aspects of their artistic practice and giving the audience a layered understanding and appreciation of the artists, their motivations, and their work processes in live discussions. The Biennale will also launch a national documentary film competition, giving young Canadian filmmakers ages 19-30 an unprecedented opportunity for professional development and international exposure through the Biennale network of international film festival alliance partners.